Adding another 20 years to EB's 28 years...Who do you think will run the show? We all know that vic and joey are too young at their age while tito sotto is running for senate. 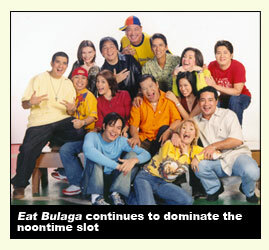 If we add another 20 years or rather 28 years to EB's 28 years, who do you think will run the noontime show? for me, they maybe continue even without the TVJ, and perhaps their own sons and daughters will do the rest for their father. Do you like ciara to continue what tito sotto had contributed in Eat bulaga? I like kempee but ciara? there are times I got irritated to her, I dont know why, maybe because sometimes she's kinda exaggerated into her action. Just an opinion, nevertheless, im pretty sure that I still support EB even if TVJ are not there. it does shows that everybody loves EB.. Are you unhappy the way how Pia Guanio host the show? TVJ will be very old by then, and we're not sure if EB will still be airing. If EB is still there I think the present co-hosts like Michael V., Janno Gibbs, and Keempee de Leon would be great replacements. They're talented and have great sense of humor just like TVJ. hi mizrak07! thanks for the coomment.